A Mass of Dead has finally been released on Steam. I hope to play fun. A Mass of Dead is now ready for release! Release Date is PDT + 10:00, 15, July. You can access to the store page of A Mass of Dead from now on. Thank you for your patients and attentions for a lone time! Now in a dead city you have been attacked by a mass of mutants... to survive in this world you have to upgrade three strong weapons and must massacre the dead. Wow this is a wonderful Game. Devs, is this project still alive? Release date was set for April - May 2015, we are in June 2015 and no sign of life for a release date. Can you update the status of this project? i could pay for this. Really liked. Hello devs. How's the development going on? Are you going to provide new info anytime soon? Hope a release date comes up as well. Thanks. all the stages are dark? I think at lease you should see your chracter. the girl in the pic made me click the link to this lol. 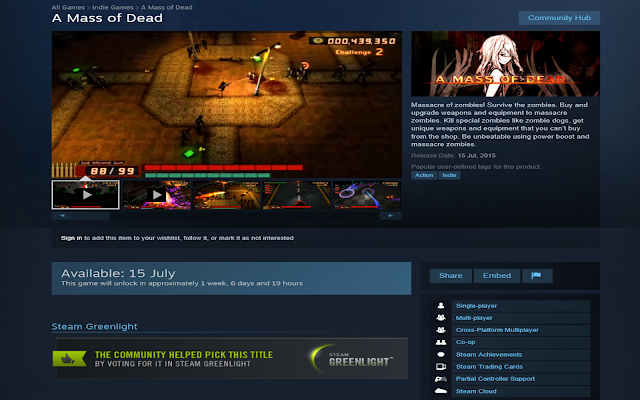 A Mass of Dead has been Greenlit and is now listed in the Steam store. For the latest information, purchase options, and discussions for A Mass of Dead, please see it on the Steam Store or in the Steam Community.